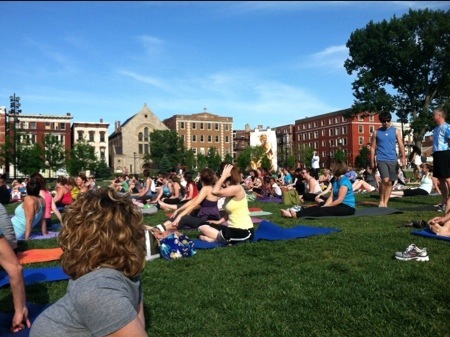 On Tuesdays in summer of 2013 from 6-7pm, enjoy free yoga in Cincinnati at Washington Park (Over-the-Rhine) from the Yoga Bar. It is a flowing vinyasa class. If you are new to yoga, don’t let the word vinyasa scare you. This class is accessible for all levels, vinyasa means alignment of movement and breath. In my first outing, I set an intention for myself and then aligned my movement into a straight line and enjoyed breathing under the beautiful sun. Just kidding, I did participate but it was hard to resist napping in near perfect 70-something weather with a slight breeze. The ladies next to me were so pleased with their first ever yoga outing they said they planned to be back the next week. Maybe you want to feel better, be calmer or connect with the community. Grab your mat, take a water bottle, maybe a hand towel and head down a little before 6pm so you can settle into your spot. Parking is available on the street (meters) or under the park (garage). How cool is it to be able to workout outside, with hundreds of friends for zero American dollars?! It’s pretty cool even if Cincinnati is known for humid summers.